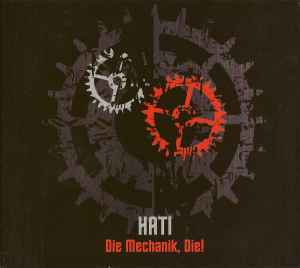 Hati ‎– Die Mechanik, Die! Recorded live at Mechanik, Gdansk, 10.01.2007. The album begins with a build up rolling metallic ambience and electronics. There are some good sounds to be heard on this album ranging from drones to distressing, reverberated wailing – as on the second track; it all makes for some interesting listening. The third part progresses into a different area with some minimal rhythm reminiscent of the Grey Wolves ‘Blood & Sand’ album. The single drone enters into an interesting percussive section with many different timbres twisting around the single droning note. The next part returns to the darker, spacious ambience as on the initial introduction. The album finishes on some delayed percussive loops and some static exodus. I have listened to this album more than once and was drawn back to listen again & again.